VA State Trooper McKenney Sues VA Cop Block Founder Nathan Cox for $1.35 Million | Virginia Right! Nathan Cox & Tom Roberts after the $10,000 VCU Settlement. Editor’s Note: Nathan Cox is a friend and a neighbor. 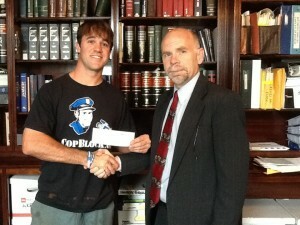 A lot of people are critical of Cox because of his activities with Cop Block. In the current political climate, cops are under a lot of stress for overreaching and exceeding their authority. Often this leads to an escalation in hostilities and the situation can turn violent in a very short period. You have probably seen the video’s of cops demanding identification and the person refusing. If you are being detained, are suspected of committing a crime and various other scenarios, the cop is completely within his authority to demand your ID. However, we also have the right of protection against unreasonable search and seizure (read the Constitution sometime). And court decisions have been quite clear on what is reasonable and what is unreasonable. Stopping an innocent person walking down the street and demanding an ID exceeds the cop’s authority in most instances. Most of us, myself included, would probably just show our ID and be on our way. But still, our rights were violated. To some, they can live with that. To others, knowingly allowing their rights to be violated in order to expedite the exchange is something they are not willing to do. A lot of my friends are critical of those who know their rights and refuse to allow them to be violated. People like Nathan Cox. They consider it disrespectful of the police, however, when a cop exceeds his legal authority and violates their rights, or attempts to violate their rights. The cop is disrespecting you! Most people don’t know what cops are allowed to do and what exceeds their authority. Those associated with Cop Block make it a point to know the difference. And from what I have seen, they usually pervail on the scene or in court. Most of these confrontations on Youtube and elsewhere are instances where the cop or government official does not know the limits of their authority. I suppose cops are always free to ask for your cooperation, and if it is not legally required, you are free to oblige or refuse. The cops that insist on your compliance for an unlawful order are either improperly trained or bullies. And it is hard to know the difference. Some video’s I have watched, when asked if they are being detained or are suspected of a crime, the cop answers “No”. And then the next question is “Am I free to go?” and that question should always be answered with a “Yes” from the cop. If you are not suspected of a crime or violation and you are not being detained it is hard to imagine a case where a cop has any option but to let you go on your way. But we all know that isn’t going to happen. The cop will run your ID to see if you have any warrants or other outstanding issues without ever suspecting that you did. And there is always the possibility of a mistaken identity situation. So the bottom line is, if the cop has no legal authority to demand your ID, justice is only preserved if you exercise those rights. The U.S. Supreme Court has recognized different standards for different types of libel plaintiffs, with public officials and figures required to show the highest degree of fault. Celebrities and others with power in a community usually are considered public figures. Politicians and high-ranking government personnel are public officials, as are public employees who have substantial responsibility for or control over the conduct of governmental affairs. Some courts have found that public school teachers and police officers also are public officials. And the bad thing about this case is that it gives the Virginia State Police a black eye as this law suit looks like nothing more than sour grapes. Trooper McKenney is causing damage to her reputation by prolonging this, filing, non suiting and filing again. It is unbecoming and frivolous in my opinion. And if you can, drop a couple of bucks in Nathan’s defense fund here. If you agree with him and his methods or not, that is not the issue. He is putting himself out there to make sure we keep our rights because so many of us are not willing to challenge unlawful authority. In March of 2014, local Richmond media (along with Virginia Cop Block) reported that I was being sued by Virginia State Trooper Melanie McKenney as a result from a traffic stop that transpired on Memorial Day weekend 2012, nearly two years prior, in which I later wrote an article about. The initial suit was for “defamation” which was filed in small claims court and she was suing me for $5,000. The initial “warrant in-debt” I received had no attached complaint or allegations and I had no idea what it was about. I later formed the opinion that McKenney was upset about something I perhaps wrote in the article about the stop. The article also included information I acquired by way of a Freedom of Information Act Request. This information I received included electronic forms of communication, radio transmissions and her dashboard camera. During this first go around, I was contacted by the Judge Judy show who wanted this case on their show and I’m under the impression they spoke with Melanie McKenney. I declined the invitation to be on the show. Melanie McKenney did not show up for her first hearing, claiming in a letter written to the Judge (in which I received a copy of), that she thought her court date was in the afternoon. So she appealed the judgement which bumped the case up to Circuit Court. I have re-hired a hands-down excellent civil rights, Constitutional attorney based out of Richmond named Thomas Roberts (and Associates). This will be the third 1st Amendment related case that Mr. Roberts (and his associates, who are EXCELLENT) has represented me on. The first case was when I was illegally pulled over by a VCU police officer. Tom Roberts won that case and VCU Settled out of court for $10,000. I once wanted to become a police officer which is half the reason why I joined the Army in 2006. I decided against it after I realized how out of control the Police-State had become. The police have become militarized and have completely morphed into something different than many years ago. It appears that most police do not take their Oaths to the Constitution seriously and that they have no problem undermining and depriving people of their Constitutional rights. Additionally, statements by police officers such as the one in this image GREATLY concern me. There is nothing wrong with holding individuals accountable for their actions, most especially public servants. In fact, it is our duty to do so. Anything less means giving tacit approval and consent of their misdeeds. However, we see here, doing so can put a target on your back for retaliation. I am now in a legal battle with this woman and I need YOUR HELP AND SUPPORT to fund this battle and my legal fees. Tom Roberts plans to counter-sue. In order to move this case forward I need the financial support of the public. It is of my opinion that this is a 1st Amendment Rights issue and I suppose a judge/ jury will decide that. In saying that, help me protect my first amendment rights and perhaps, although it’s not clear, this case could help set a precedent in protecting YOUR first amendment rights in the process. You can view the 11 page lawsuit & make your donation —> HERE. No donation is too little or too small! ← Forum: What Are Some Of Your Favorite Jokes? Another whining sniveling trooper got their feelings hurt. Anything turn law abiding citizens into criminals and to avoid confronting real criminals. Cowardice, McKeneny is thy name.